Pinchemel - A family of "Adriens", Postmasters and "Passementiers"
!! Most of the information came from André îoidure, see his excellent webside http://andre.froidure.free.fr/ !! Quevauvillers ( Equitum villa) was, as the name suggests, a "poste de cavalerie" on the important Roman route from Amiens to Rouen. Between Quevauvillers and the next Roman camping place "Romescamps" as this name indicates we find places like Poix and Ste Segrée. 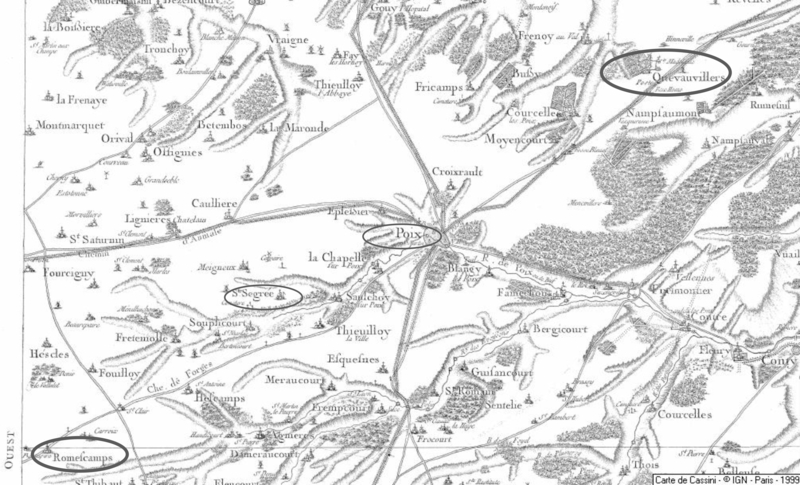 - When in the 18th century regular coach services started between Amiens and Rouen Qeuvauvillers became a halt and we find postmasters and postilions (F: postillon, Nl: postkoetsier ) in this village (see small Cassini map of Quevauvillers). - The economic activity was sustained by weekly markets and 3 fairs a year around the "Ste Madeleine" church. Wellknown are the "passementiers" (Nl: lintenmakers voor hoeden, strikken enz.) busy in the manufacture of ribbons, but who produced also tresses and ornaments for military and other uniforms. - Quevauvillers was a good place to be and next the church we find instead of the Roman camp a castle with a nice garden in the middle of the village. Local masons and other personnal were used for the construction and maintenance of castle and church. (QuevauvillersDoc\QuevauvillersHistory.htm). Our branch starts with the mason Adrien Pinchemel born ca 1635. Although Baptismal registers exist from 1598 till 1792, an important gap between 1629 and 1684 makes it difficult to reconstruct the first generation born between 1664 and 1675. It makes that we know only three children and that we are not sure of his daughther Marie (° 1670) x Pierre Magnier and thatwe have only knowledge of his first child Adrien, born 1674, when this Adrien married in 1702 in Quévauvillers with Catherine Percheval from a family of "Passementiers". The first surviving son of this last one was as well an Adrien born 1712, who married in 1737 Clotilde Demarsy and was our first known postmaster of this family. The same first name we will find back in the 2 oldest sons of this Andrien (°1712, x 1737 ) namely André Pierre Hyppolite °1738, also postmaster, and Adrien Hyacinthe °1740 but the "'Adrien" line will not continue because this sons prefer in common use Hippolite and Hyacinthe. Although the postmaster Hippolite Pinchemel °1738 had 16 children from 2 mariages* none of them was an Adrien. Remarquable was the start of his second mariage. Probably he married his second wife in another parish, although both lived in Quévauvillers, so the pastor of Quevauvillers obliged them in 1773 to recelebrate their mariage in his parish. Some of his children have the typical professions of this small village. - His sons Jean Baptiste °1781 and Casimir°1786 became postilions (F: postillon, Nl: postkoetsier ) on the route Amiens - Quévauvillers - Poix - St Segrée ... Rouen, living respectively in Poix and St Segrée, another son Amand °1783, an ex-soldier, "ménager" (agriculteur petit propriétaire) , died in 1816 shortly after his mariage leaving his wife and one child behind. - His daughthers Marie Josèphe °1775 and Gabrièle °1779 and their descendants were "passementiers". Although Hippolite Pinchemel had 16 children out of his 2 mariages 8 of them died young and from the grandchildren we have only knowlege of one male child Constant Pinchemel who will continue the patronyme. * Also there is discusion about the mother of some of his children an the year his first wife died.